I currently don’t have much to say about poker. I had a dry run in a limited number of events at Borgata. I’ve been spending a good deal of time on other things, and have felt kind of disinterested and emotionally removed from the poker scene. I’m playing most of the WSOP Hammond Events a couple of weeks and I hope that’ll go well. Ivy is awesome and Janeen’s second pregnancy is going fine. This one’s a boy! His in utero name is D’Brickashaw. The Jets All Pro left tackle is a fixture in my world and it’s been years since I gave any consideration to his ornate first name. However, I recently watched a Jets preseason game with Janeen, and she finds the idea of a human being named D’Brickashaw hilarious, so that’s what we’ve been calling our unborn son. And now I’m gonna post something about a television show. Janeen likes for she and I to have “a show.” “A show” means a television program we watch together. I grew up doing this, but until I met Janeen, I had almost completely stopped watching any television shows with regularity. She and I have different taste in primetime TV: she’s easier to please and watches probably ten or twelve shows religiously (the memory space on our DVR is perpetually over 50% full). I am a massive skeptic when it comes to television in general. Left to my own devices, I basically pretend that primetime shows don’t even exist. I’m not entirely opposed to watching TV shows, but there have been very few that I truthfully enjoy. Still, having “a show” has long been a part of my relationship with Janeen. We’ve cycled through a bunch of them. Some were good, some were just okay, and some were really dreadful. I survived the awful ones by focusing on the satisfaction it gave Janeen to have a partner to watch them with. There was one show—which sadly we’ve now seen every episode of—that was much better than the rest. It was the best television show I’ve ever seen. Last year, a few different people suggested that Janeen and I adopt The Wire—an HBO program that lasted five seasons before being canceled in 2008—as our new show. We did so, and I’m very grateful for it. 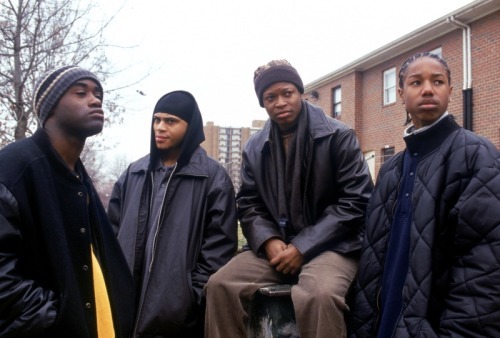 The Wire is a show about cops, the drug trade and politicians set in Baltimore, Maryland. It is initially challenging. The first few episodes are confounding and not easy to decipher. At the outset, the viewer is left to his own devices, forced to familiarize himself with what is going on with minimal hand holding from the show’s creator, David Simon. The show panders to no one and makes no apologies for an 80% black cast speaking a language few viewers are familiar with. Because The Wire refused to package itself in a way that is easy to initially digest, it’s not surprising to me that it never achieved widespread viewership. The show breaks a lot of rules. When the only character on your show with a real moral compass is an openly gay stick up artist, you know you’re watching something a little different. Once you settle in and get the hang of The Wire, it is nothing short of awesome. What is slowly revealed is an incredibly ambitious and enthralling narrative. The show is a revelation on many levels. Sometimes morbidly depressing and other times uproariously funny, the show has a lyrical quality and delivers one great one-liner after another, but at the same time it is magnificent storytelling; the end of certain episodes evokes the same feeling achieved when finishing a crucial chapter in an epic book. The Wire really stays with you after you turn it off, and that might be the highest compliment that can be paid to a television program. The characters—almost without exception and including the peripheral ones—are complex and richly drawn. Simon and his cast of writers and directors coax brilliant performances from various bit players, some of whom are not even professional actors. Although The Wire boasts a cadre of uniquely memorable characters, perhaps its greatest triumph is that we never lose sight of the real star of the show: the City of Baltimore. The show bounces effortlessly around the gritty urban world it covers, from the street to the police to the suits ostensibly in charge of it all. There is sharp social commentary woven into the episodes in a way that somehow never feels contrived. The Wire is a fascinating expose of urban America, it lays bare much of what is hopelessly wrong with our cities. And if that was all there was to the show it would still be a triumph, but The Wire digs much deeper and does so successfully. Innumerable and sometimes surprising political issues are touched upon, and through it all, The Wire manages to stay authentic. The show is just… real. The Wire is so good that it ranks as both the top detective show and top urban drama I’ve ever seen. It is everything that both of these otherwise tired genres wish they were. Once you’re exposed to The Wire, so much of everything else they’re doing on TV feels like straight wankery. Janeen and I recently finished the fifth and final season of The Wire. I initially refused to begin Season 5—we waited over a month between the last episode of Season 4 and the first episode of Season 5—because I didn’t want the damn thing to end. There’s an empty space in my life now. The show is that freakin’ good. Best show ever. Sux about poker. So on point WRT The Wire. Watch is again. i totally agree the wire is great. if you want a similar story telling experience check out breaking bad. it is finishing up the 4th season now. season’s 1-3 are on dvd. I’ll do what I can to help y’all. But, the game’s out there, and it’s play or get played. That simple. HBO’s Boardwalk Empire is pretty awesome. Give it a go. I was a graphic designer for a hip hop clothing company named ‘5 points’. Marlo wears ‘5 points’ gear with my designs regularly throughout the show. Omar is still my favorite tho, obv. try Breaking Bad. Its even better. My brethren in blue claim that “The Wire” is the most realistic police show ever. It is next on the “shows to watch list”. First the wife and I have to finish season 7 and 8 of “24” Jack Bauer rules!!! D’Brickashaw huh? I would love to know how Ma Dukes came up with that name. If you need help with some more common names such as Raheem, Tarik, or Darnell let me know. +1 on breaking bad. have to give it a shot. Once you start, you’ll be caught up in a week. Dexter is worth it too.